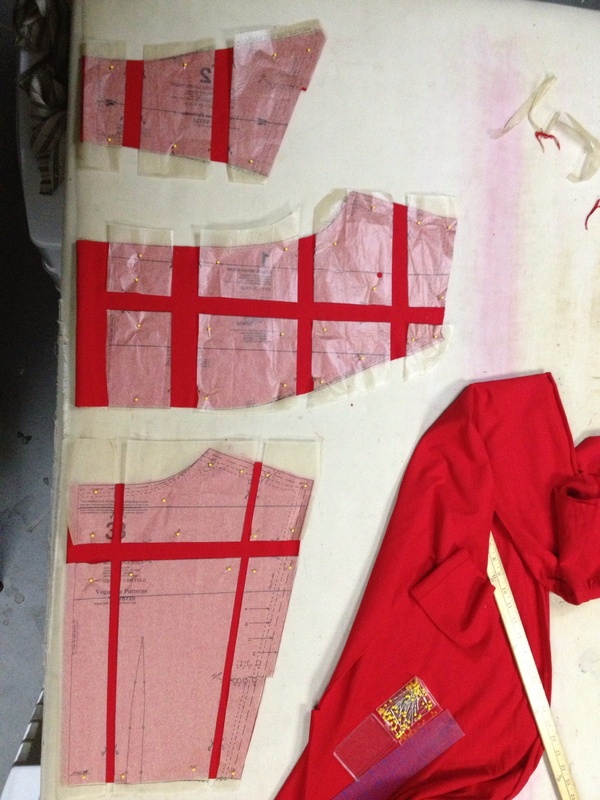 So when you grade a pattern, you need to expand it both lengthwise and widthwise. It is worth noting that, as per my usual, I was doing this in a big bad hurry as part of a costuming emergency – the Vintage Vogue pattern I needed was only available in a small-y sort of size at the time I needed it, but it was faster to buy the pattern and grade it up than to draft the pattern (or drive to another JoAnn’s, for that matter). My point is that if you are reading this as one who is wise in the ways of pattern grading, this might look a bit slap-dash. Don’t worry. It was. 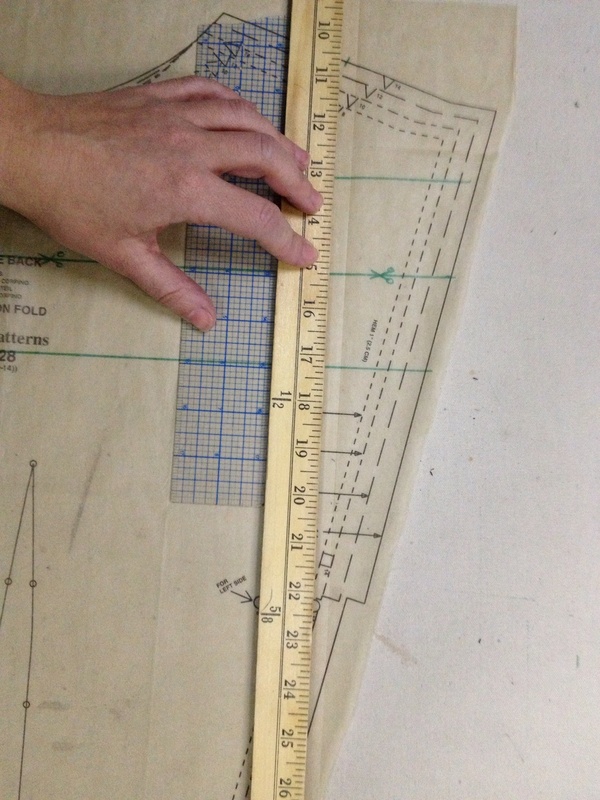 The tools you will need: your pattern pieces, rulers, and a pencil. Well, Sharpie, in my case. Start by marking horizontal lines on the pattern. You want the lines for the front and back of the pattern to line up. But wait! How many lines do I need? Where do they go? As with so many things, the answer is a firm “it depends”. The more curve to your pieces, the more you want to divide them. 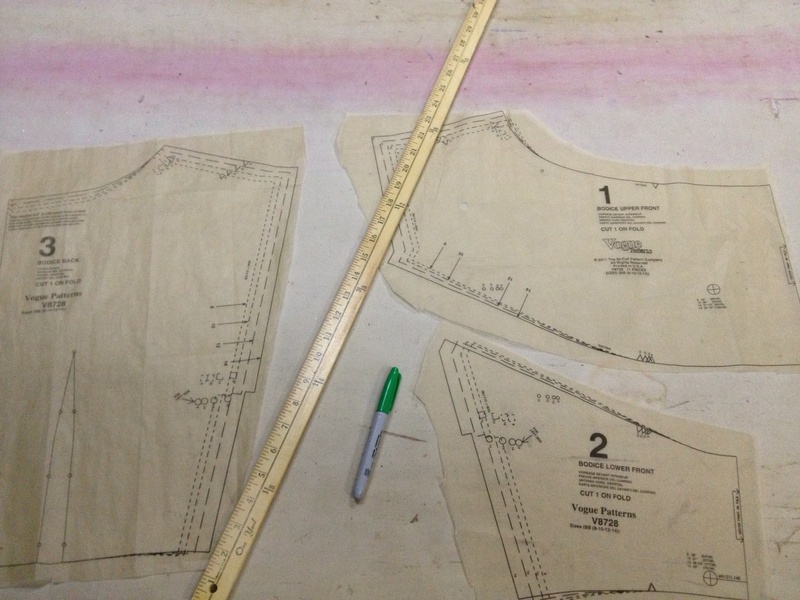 If I was grading a rectangular skirt piece, I could cut it into four pieces and spread them without losing any of the information in the pattern. With something more complex, like this bodice, I want my pieces to be small enough to let me distribute changes evenly along the curves without losing the general shape and proportions of the pattern piece. I personally don’t want to work with pieces that are smaller than 3″. Nothing scientific there; it’s just annoying. I don’t want lines that go right through corners, either. The corner is an important piece of information. Once I’ve established my cutting grid, I add horizontal and vertical alignment guidelines to my pieces. 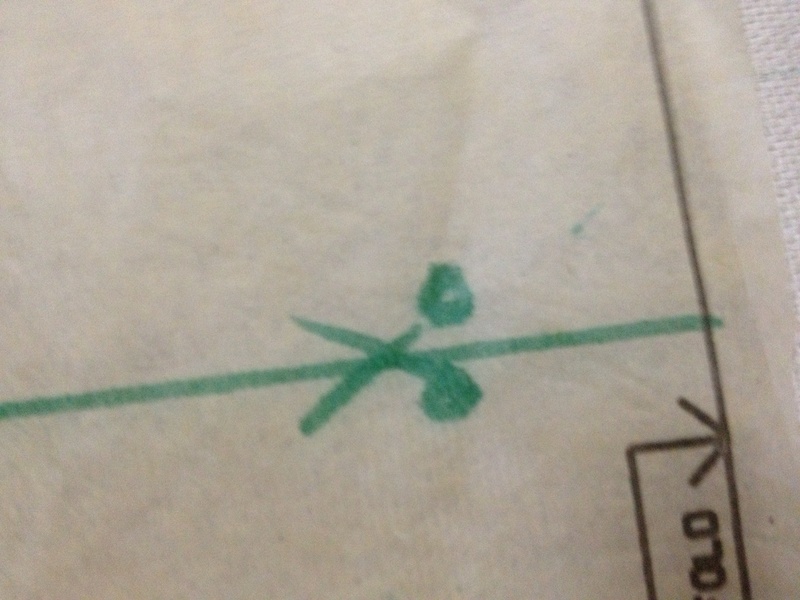 I can now cut my pieces apart on the cutting lines…. 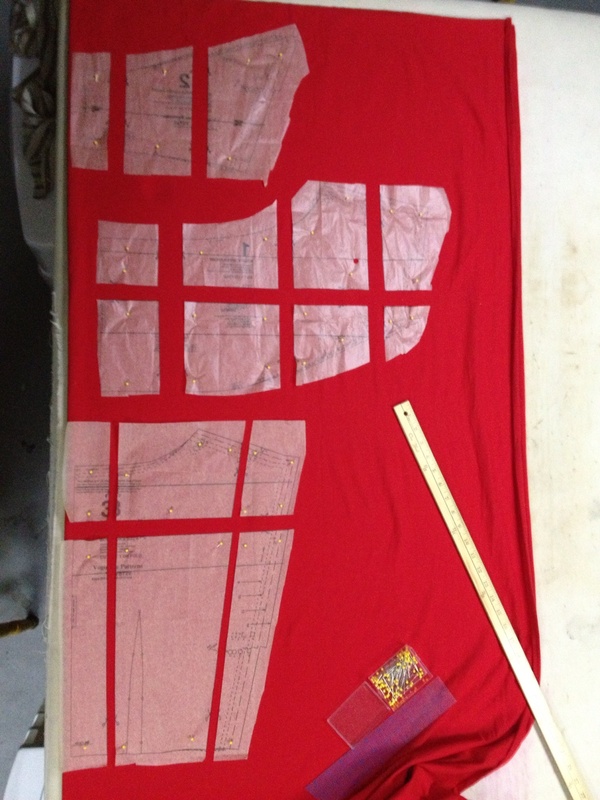 …and lay them out with space between, using my alignment guides (and a ruler) to keep everything straight. You may notice that I am doing this directly on my fashion fabric. 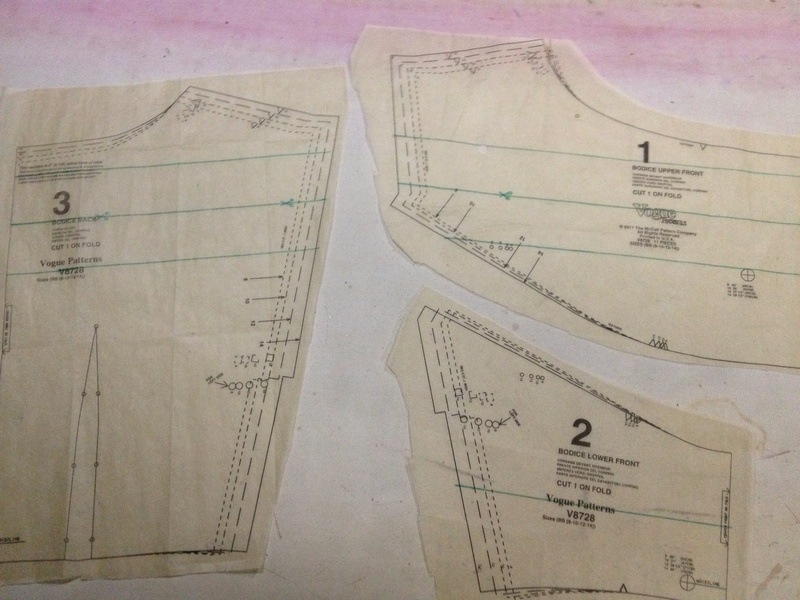 Unless you’re stupidly overconfident and positive that you will never need this new size again, I’d recommend doing this on paper first to make a new pattern. So, wait, I hear you ask, how do you know how far apart to spread the pieces? 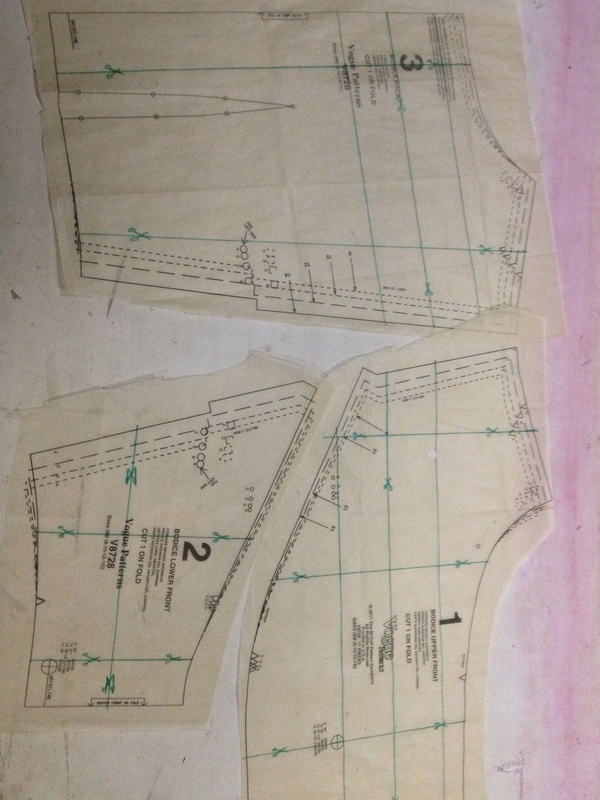 Measure the pattern piece (subtracting the seam allowances). Subtract this from your target measurements. Divide this amount by the number of cutting lines you’re using. 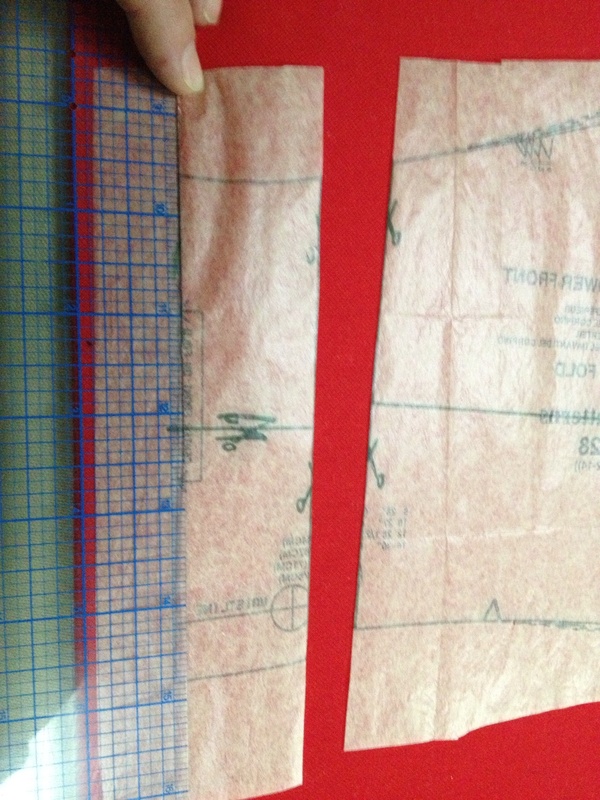 For example, if I want to increase by 1 1/2″, and I have three cutting lines, I spread by 1/2″. When in doubt, go a hair large – it’s way easier to tailor down in size than up in size. Here’s the deal: you want the curves to be smooth, which means that sometimes you will deviate from the edges marked on the original pieces (mostly at corners). I’ve left the final graded pieces under the original tissue pieces so you can look at the difference between the marked black lines on the pattern and the cut pieces. Technically, this process of making your curves nice and pretty is called truing, and should be done on paper with a french curve and/or a ruler rather than on fabric with a scissors. Um…. I have no excuses for my behavior. I just figured I should take the pictures while I was actually doing it, rather than wait for a time when I had time to do it right. “Having time” is not currently one of my strong suits. And, oddly, that’s about it. People get all spaztastic about the idea of changing the size of a pattern radically, but at the most basic level, you’re just cutting the piece up on a grid and adding space. Can I just say THANK YOU? I’ve ready so many articles on grading, and they don’t sink in. I can wrap my head around this. Mercy buckets! Thank you so much for taking the time to post this, and making it easy to understand. I’ve looked at countless other tutorials and they all make it much more difficult than it needs to be. Thank you. I finally get it.